It’s FINALLY spring, which means kids will be playing outdoors, participating in sports, and overall exerting more energy! The harder they play, the more energy they’ll need from food. Choosing healthy snacks for your child is extremely important. Remember, quick and portable do not have to mean unhealthy. Snacks such as chips and candy contain empty calories, leaving children hungry, wanting to eat more. There are healthy snack options in each of the five major food groups: protein, fruit, vegetable, dairy, and grains. Combining multiple food groups within one snack can help improve substance and variety in your child’s diet. One of our favorite ways to incorporate variety into your family’s diet is by having a PICNIC! A balanced meal includes fruits and vegetables, protein, dairy, and fiber rich carbohydrates. 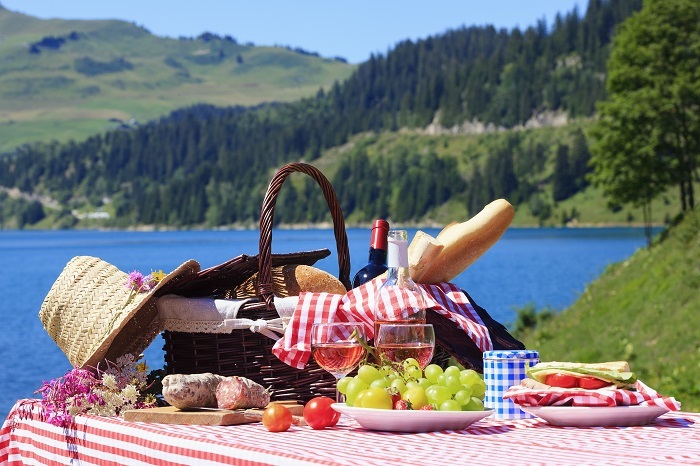 Be smart when packing your picnic, including a variety of items from each food group! For your next picnic, try these fun, easy recipes for Tortilla Pinwheel Lollipops and Vegetarian Pasta Salad. Preparing food as a family teaches children the importance of eating healthy and balanced meals and snacks. Involving your kids in the kitchen will spark their interest in experimenting with new items. 1 cup cheddar cheese chunks about equal to 4 cheese sticks! Prepare pasta per direction on box. Once pasta is cooked, rinse in cool water, drain and set aside. Cook 1 cup of edamame per the instructions on the box. Set aside to cool. Chop and prepare your carrots, tomatoes, olives and cheese. Place all ingredients into a large bowl. Mix until combined well.